Pulmonary nodules or lung nodules are small masses of tissues in the lung. These nodules are common and are usually benign. Lung nodules are around 5 millimeters (0.2 inches) to 25 millimeter (1 inch) small. Anything larger than 25 millimeters may be cancerous. 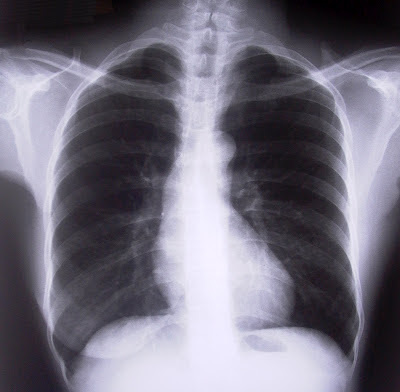 An early test to diagnose a pulmonary nodule is to compare past x-ray or CT scan to the present one. This shows whether the nodule has significantly grown in size since the last scan or x-ray. If the nodule hasn't increased in size, it is most probably benign (non-cancerous). Non-cancerous pulmonary nodules can be formed for a variety of reasons. These are infections, hamartoma (normal cells clumped together), cysts, and abnormalities in the blood flow and blood vessels. Constant monitoring of the nodule and comparative imaging test may determine the course of action in treating this type of pulmonary nodule. More often than not, it requires minimal or no treatment. Researchers from Israel and Colorado collected exhaled breath from each patient, analyzing the exhaled volatile organic compounds using gas chromatography with mass spectrometry and information from chemical nanoarrays, which have been developed by Prof. Hossam Haick and his colleagues in the Technion-Israel Institute of Technology. The patients also underwent a bronchoscopy, wedge resection and/or lobectomy, whichever was required for final diagnosis. Nodules that either regressed or remained stable over a 24-month period were considered benign. The two techniques accurately identified that 53 pulmonary nodules were malignant and 19 were benign. Furthermore, the nanoarrays method discriminated between adenocarcinoma and squamous cell carcinoma and between early versus advanced disease. This kind of testing could help solve some of the problems computed tomography screening has created. While low-dose CT screening has reduced the mortality rate by 20 percent, many people have to undergo invasive procedures only to find out their pulmonary nodules are not cancerous. The false positive rate is 96 percent. This testing could serve as a secondary screener for patients who were found to have pulmonary nodules after CT screening. Authors say, "the reported breath test in this study could have significant impact on reducing unnecessary inves¬tigation and reducing the risk of procedure-related morbid¬ity and costs. In addition, it could facilitate faster therapeutic intervention, replacing time-consuming clinical follow-up that would eventually lead to the same intervention."